".....you can't kill a dream; you can only wake me up...."
Editor's note: Bill Dunlap drove Larry Huff's Soapy Sales RED through the summer of 1973 before being replaced by Dave Uyehara. The team of Larry Huff and Mike Fuller would see the year out before Mike, needing to spend more time with his new business (Mountain Cascade), also got out of racing (see Dunlap - Part 1). It would be eighteen years before Bill Dunlap and Mike Fuller would reunite in a partnership that would last the good part of fifteen years. Bill: I was a little bitter after Huff fired me, but I still had my Woody car. Instead of selling it, I stored it on the rafters in my garage. I also kept my license current hoping some day to get another ride. It took eighteen years, but that opportunity finally came when I got a call from Mike Fuller. I had kept in touch with Mike, and at a social function a few years earlier, mentioned to him my interest in getting back into the sport. The day I heard from Mike I actually had spoken to Rich Guasco first. Rich and Mike had grown up in the same town and had been buddies for years. Mike wanted to know if I still had the Woody car and my competition license. When I told him I did, he said, "Well, do you want to go nostalgia racing?" I replied that I did but honestly could not afford to do it. 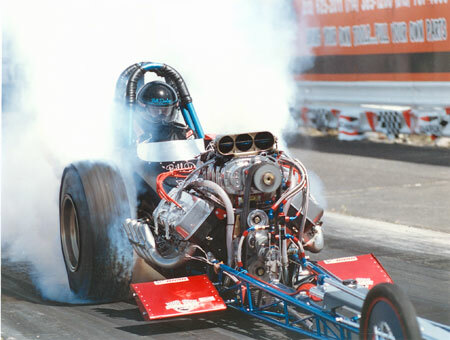 Mike said he could fund the operation, so I gave him my Woody car and that is how we got back together.
."I cannot recall any specific discussions with Bill about his return to drag racing, but I knew it was something he longed to do. When Mike asked him to drive, Bill did not ask me how I felt about it. But, it wasn't necessary. By that time, I had been around the sport enough to see what it was all about. I never had any reservations about his driving again, especially after meeting Mike and Sharon Fuller. They were good, generous, and sensible people. 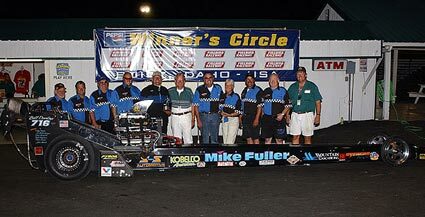 I felt comfortable with them and that was important to me because, ultimately, Mike was responsible for what his race car did on the drag strip. 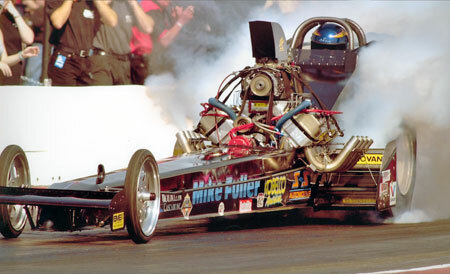 When people find out that my husband drives a top fuel dragster, I get the same question, "Doesn't it scare you"? My usual reply is, "No, it doesn't scare me. What scares me is driving to work every day." I wish I could drive to work under the same conditions Bill drives a race car." Bill's Woody car was the last FED Gilmore ever assembled. Mike took it to Harry Hoffman to be strengthened and updated with a five point roll cage. The car was outfitted with a cast iron 392 and the weathered yellow panels were repainted black. Bill: In the late summer of 1992, we took the car out to Sears Point for a Goodguys race. It turned out to be a forgettable weekend as we had the chute fall out on a burnout and then discovered a crack in a cylinder wall. So, we loaded up the car and took it home. After we tore it down, we found the crack to be only a scratch. Relieved by the discovery, we put the engine back together, took the car down to Bakersfield, and won the very first California Hot Rod Reunion. Back then, a good run for us was in the 6.90s. These cars were a real handful to drive as they really wanted to move around on you. I think a lot of it had to do with the tires which simply were not as good as now. I remember going through the lights at Famoso on two wheels one way and then the other way. However, it wasn't just me - I remember a lot of drivers experiencing the same thing. First time out with the Woody car at Sears Point in 1992. Maiden pass with the Woody car was memorable, if forgettable - the chute accidently came out on the run. 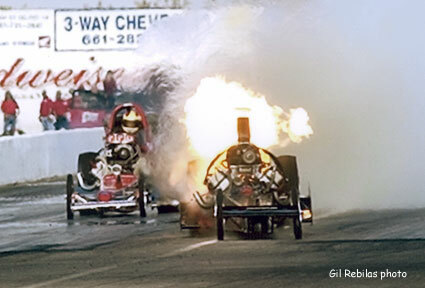 Final round of the inaugural CHRR versus Sam Chastain and Frank "Root Beer" Hedge at Famoso Raceway, November 1992. 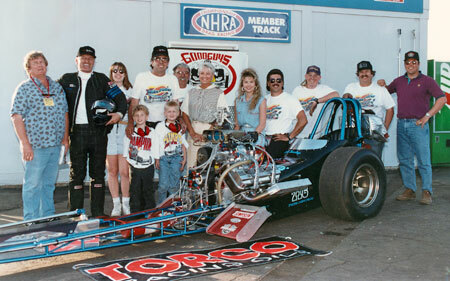 Winner's circle at the 1992 CHRR. 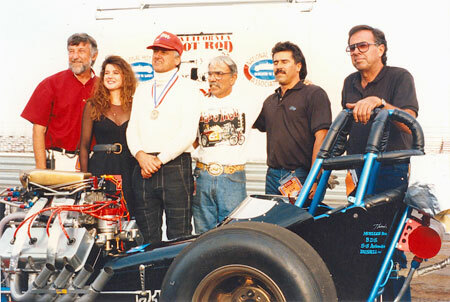 Steve Gibbs, Trophy Girl, Dunlap, Rich Guasco, crew and Mike Fuller. Jack Williams at the far left . 1994 March Meet - the two team cars in the winner's circle Larry Huff at the far right. 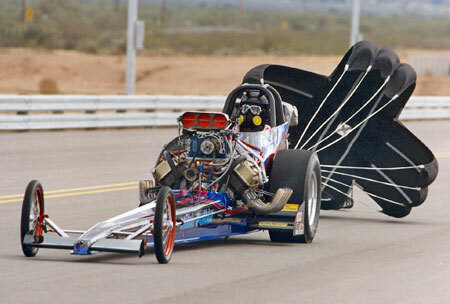 Chute shots from Famoso Raceway in 1994. 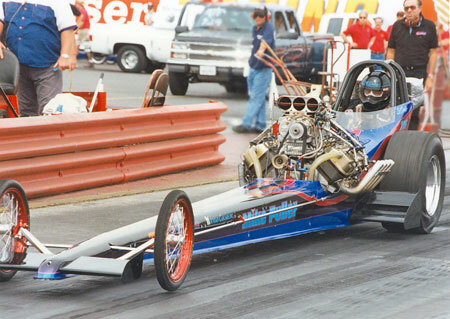 1994 CHRR against teammate Larry Huff driving Pure Hell. 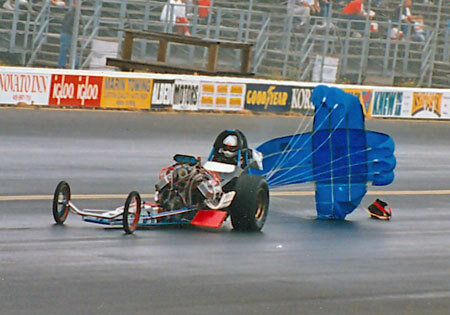 Dunlap versus Pierrre Poncia at Sacramento in 1993. Mike and Bill retired the Woody car at the end of the 1994 season. Today, the car is being restored by John Walsh (of The Wailer top fuel dragster fame) for cacklefests and displays at the museum. 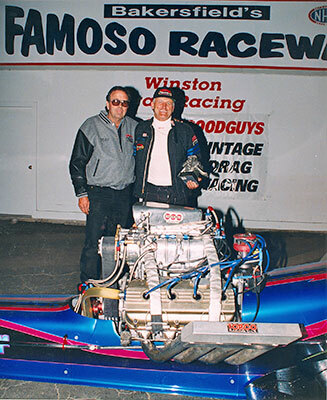 Mike and Bill raced their vintage Woody car for about three years before it was replaced in1995 with a brand new dragster built by Dave Uyehara. During that time, they won not only the inaugural CHRR, but the 1994 Goodguys March and 1994 Jim Davis Memorial meets as well. 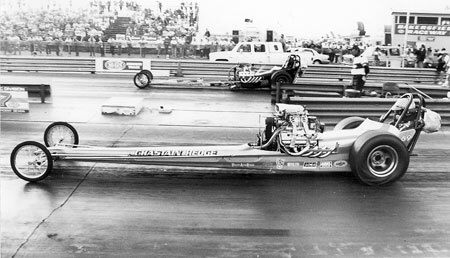 Nostalgia drag racing was slowly maturing from events where old friends met and reminisced about "the good old days" into a structured series of races with points and a purse. Bill: Nostalgia drag racing took a while to catch on with the fans. In the beginning, there were not a lot of people in the stands and that must have made it hard on the promoters. But, slowly it caught on, and as car counts increased, so did the number of fans in attendance. 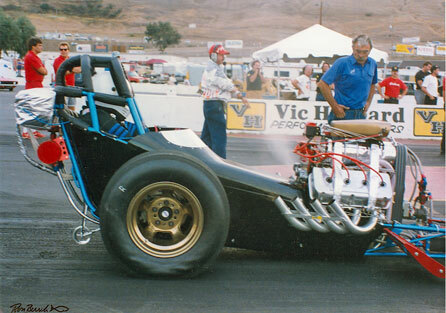 NHRA's support and promotion of its California Hot Rod Reunion was a big reason nostalgia drag racing took off, and today, has become a permanent part of the drag racing map. Our first race with the new Uyehara car was a Goodguys deal at Sears Point. I never saw the car until it showed up at the track straight from Dave's shop; it didn't even have any paint on it. Compared to my trusty old Woody car, this was simply a great race car-the sweetest handling car ever. 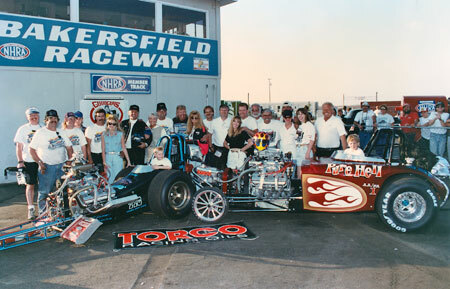 With it, we won a host of races including the '97 March Meet and the '97 California Hot Rod Reunion. 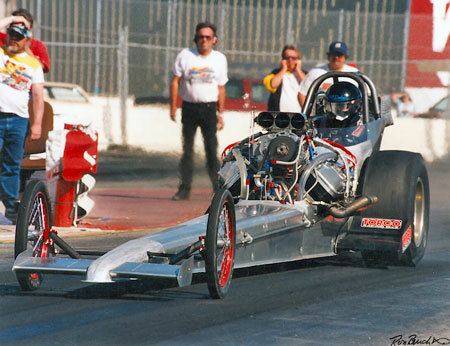 We were also the first top fuel dragster to make a five second run at a Goodguys event-- 5.98 at Sears Point. 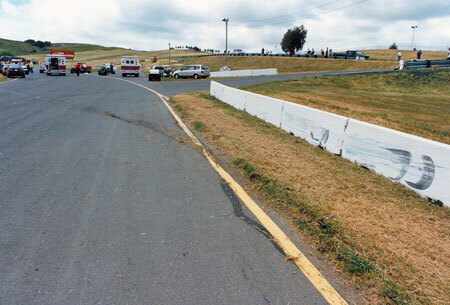 April 22, 1995 - first pass in the Uyehara car at Sears Point Raceway. Famoso Raceway (1995) versus Ty Norton. 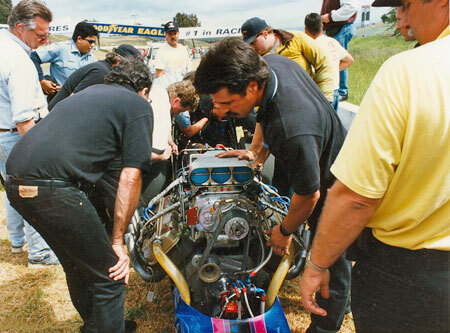 Mike Fuller and Bill Dunlap won the 1997 Goodguys March Meet with Paul Romaine's engine (Paul is second to right). 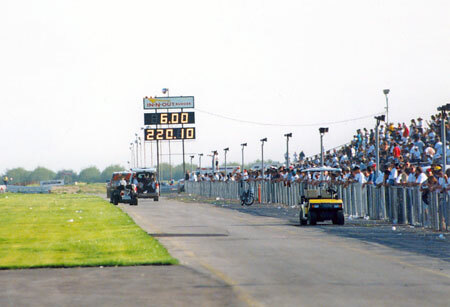 Final round of the 1997 Fremont Reunion Drags at Sacramento Raceway; versus Ground Zero. 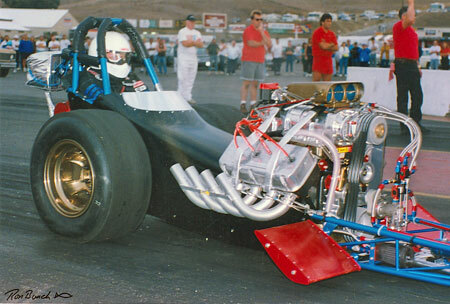 The 225" '95 Uyehara car was powered by a 430 cid Donovan engine and had a best time of 5.98 (Sears Point) and 238 mph (Bakersfield). Donovan engine with BDS supercharger and the Hot Heads aluminum cylinder heads. 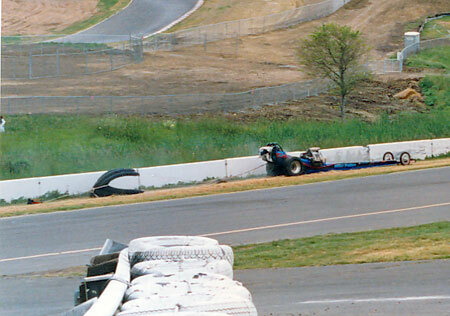 During a race against Gerry Steiner at Sear's Point in 1997, Bill got a face full of oil, hit the tire barrier for the pedestrian bridge, and took a cruise of the race track usually reserved for the open wheel cars before coming to a stop along the K rail. 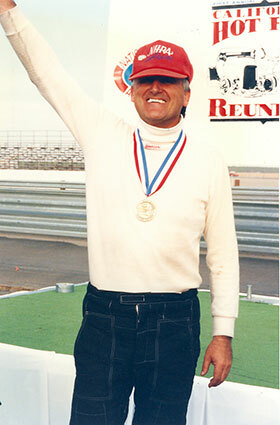 After the accident at Sears Point in 1997, Bill switched from the visor to old school goggles. 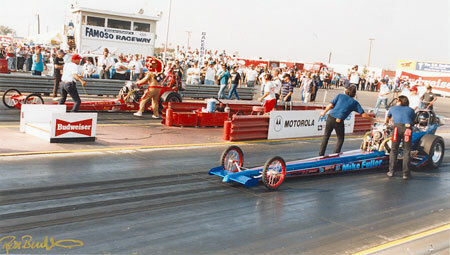 At the 1998 March Meet, Dunlap and Jim Murphy ran identical 6.00s with Bill crossing the finish line first. Later, he was DQd when it was judged his tire crossed over the center line. 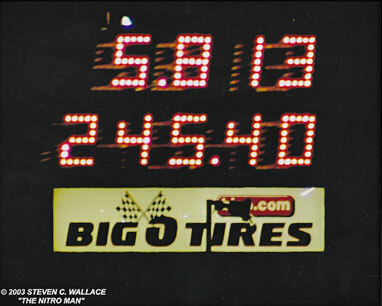 Bill: Interest in nostalgia drag racing picked up in the mid '90s, and especially so after the Goodguys got their point series organized. We had one of the cars to beat, but there was always plenty of good competition. There was Paul Romaine, Sammy Hale and Champion Speed Shop, the Kaisers, Ty Norton and Jesse Perkins, the Boyds, Dan Horan Sr., and Sam Chastain, just to name a few. We must have raced Sam and Frank (Hedge) eight or ten times, and Horan was another tough customer. 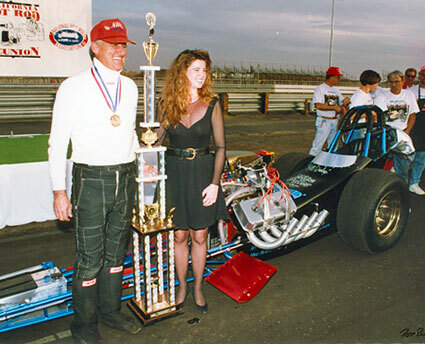 I remember an ANRA race at Bakersfield in which Horan ran a 6.16 and that finally eclipsed John Wiebe's 6.17 which had stood as the lowest e.t. 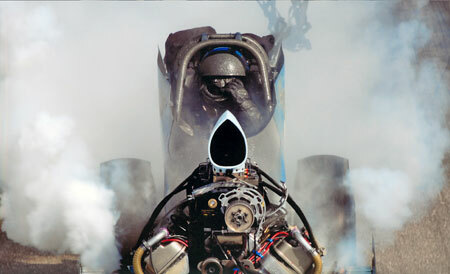 for a front engine dragster since 1972. After the 1998 season Mike sold the Uyehara car to John Halstead and ordered a new one from Dave. 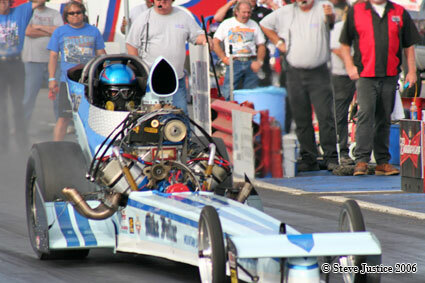 This was the dragster Steve Gibbs nicknamed "the coupe" for the way the cowling came right up to my face. 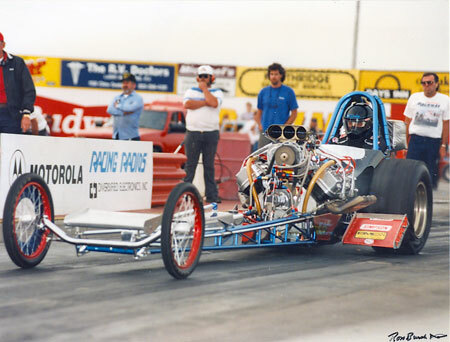 We were moderately successful with this car winning a couple Pro Nitro events in Arizona, the B division at the '99 March Meet, and the B division at the 2000 Goodguys Hot Rod Happenin' and the Fall Classic. In 2001, we came out with the current car. 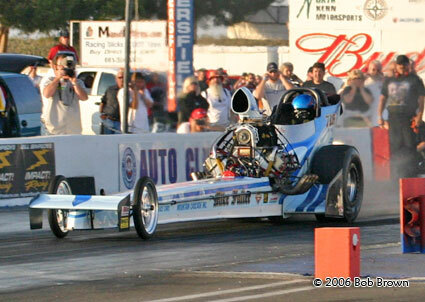 This is the one in which we recorded our quickest time and fastest speed: a 5.81 at Sacramento and 255 mph at Bakersfield. 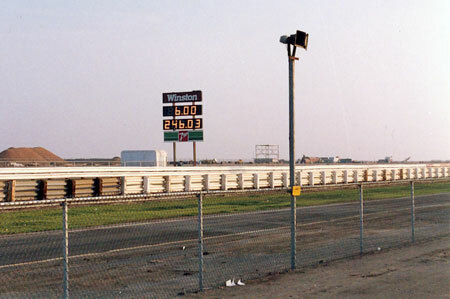 I actually ran a 5.75 at Bakersfield but it was not allowed. We had a remote oil filter in front of the engine and the oil line broke under the canard. That put oil on the tire although I could not see it. The car pulled me to the center and I took out the lights in the process. I think Jack Harris' run was DQd, too. The 3rd URC car was nicknamed the "Bat Car" for its distinctive blower scoop; got oil? 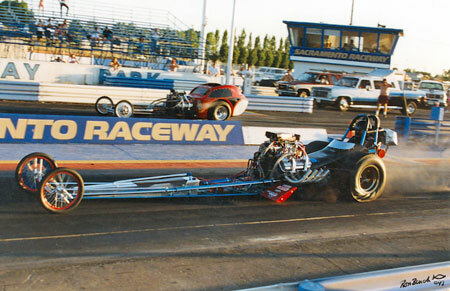 The final of the 2003 Governor's Cup at Sacramento would, at the time, result in the quickest side by side nostalgia top fuel race in history. 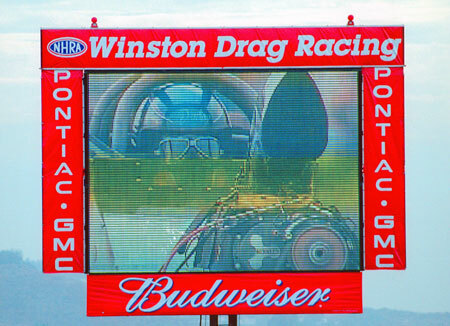 Jim Murphy won the race with a 5.832-239.98 to Bill's time shown above. 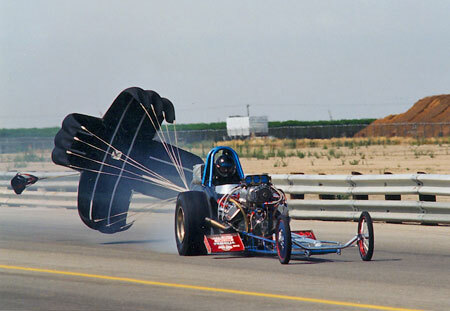 In the semis, Bill suffered an engine explosion, slid sideways, and when the chute caught on the guard rail from the wind, tipped the car on its side. This necessitated a furious thrash by the Fuller crew prior to the final. Under the Goodguys umbrella, nostalgia top fuel competition got better and better, and as car counts increased, so did the number of fans attending the events, At the 2002 Nitro Nationals at Infineon Raceway, so many fans showed up that the newly refurbished facility was unable to accommodate all the cars. Many of the fans in attendance that day had to be bused in from outlying dirt lots. Fuller-Dunlap, always one of the cars to beat, continued its winning ways. 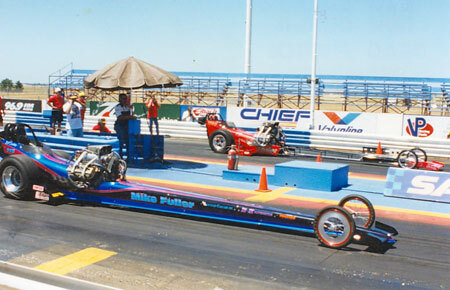 In 2002, they won the CHRR top fuel B division, and in 2003, the prestigious Pepsi Nightfire Nationals. Along with Jim Murphy and Jack Harris, they were always in the hunt. Then, things started to go wrong. The car was not performing as consistently quick as before and there were more than a few hot rides for the driver. 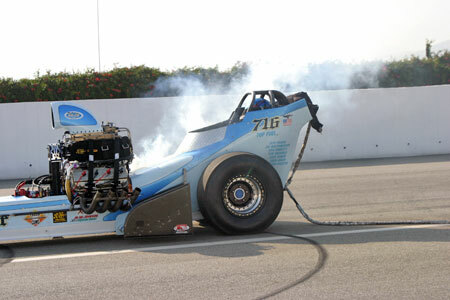 At the 2005 Goodguys event at Sonoma, Dunlap had Brett Harris covered until the engine blew up at 1100'. The car had slowly begun to slip out of the top of the class. In an effort to shake things up, the team showed up at the 2006 March Meet with a new body and color design. 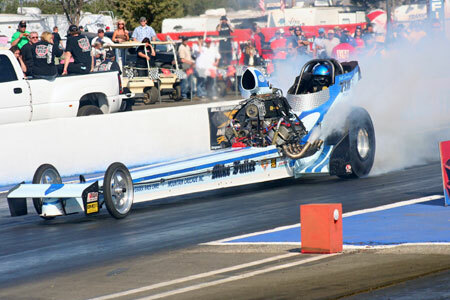 Rejuvenated, the team won the 30th Annual Nitro Nite of Fire at Sacramento Raceway. They seemed to be creeping back to the top, although a major win continued to elude them. Bill: We had a black race car and it was not working. The new design and color was an attempt to shake loose from "the bads". At the 2007 March Meet we were having trouble and did not qualify in the upper half of the field. In round one of eliminations, I was paired with Stu and The Circuit Breaker. It was a close side-by-side race so I did not want to lift. As soon as I shut off, I got "oiled in" about as bad as I could ever recall-it was pretty grim. But, I got the car stopped without incident. Everything was OK except I had so much oil on me it was literally dripping down my suit. March 11, 2007-E1 at the '07 March Meet. 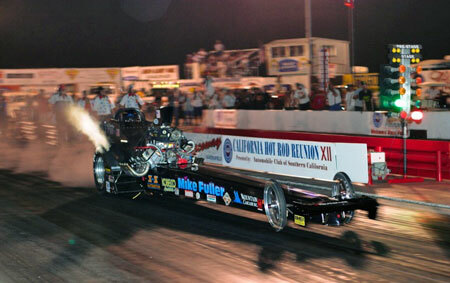 This would be Bill's final pass for Mike Fuller. Though totally blinded by the engine oil, Bill stayed in his lane and got the car safely stopped. 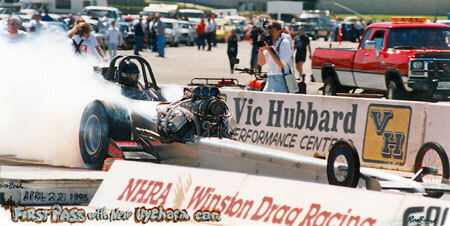 Despite the engine explosion, Bill still ran a 5.951 at 245.83 in a losing effort against Shannon Stuart. ..that just goes along with the territory. If I'm going to get in the car, I have to expect that these things will happen. If a driver is going to whine and cry about it, then he should find something else to do." Bill: After the March Meet, I drove up to Mike's one Saturday to work on the dragster. When I got to the shop Mike said he needed to talk with me in the office. He asked me how much longer I thought I wanted to drive. I told him I hadn't thought about it much, but wanted to finish out the year and maybe another year after that. Puzzled, I said, "Am I not doing a good job?" Mike replied that he had seen a picture of the run against the Circuit Breaker at the March Meet on the internet and had no idea what I was going through on the top end. He felt that if we continued on I might get hurt, and because we had been together for so long, he would not be able to handle that possibility very well. Having said that, he then told me he wanted to put another driver in the car. I knew it was a very difficult decision for him, but I respected the honest and forthright way in which Mike did it. He did invite me to remain with the team, but I didn't feel comfortable with the idea and declined his offer. I'm not ready to quit because I still think I can drive. I would consider another eliminator even if I had to step down a class. 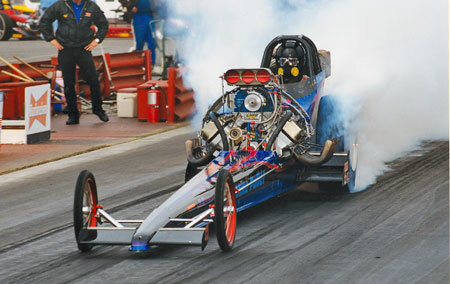 But, I'm a top fuel dragster guy and would like to stay with those race cars until I do retire; I will take it as it comes. Editor's note: When Brendan Murry was hurt in a racing accident in the summer of 2007, Bill stepped in as the driver for Running Wild Racing while Murry recovered from his injuries. 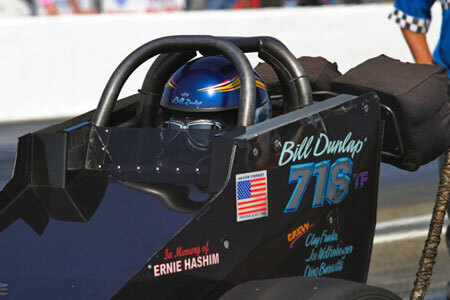 Although Brendan is again driving the potent Chevy-powered Stirling car, Bill is still listed as the car's "test pilot" on the All American Fuel Dragster web site. 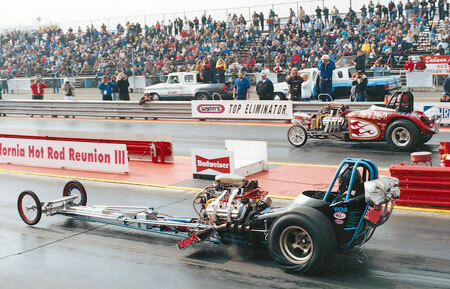 Bill: These nostalgia dragsters are a totally different breed from the FEDs of the 1960s. Back then, we used Goodyears and generally the car would stick pretty well. With the smaller M&Hs, the nostalgia dragster wants to move around. So, the driver has to be totally focused on the task at hand and ready for any possibility. If the car starts breaking loose, you have to get on the brake and slow down the tire spin. It will generally respond and straighten out pretty good-the motor doesn't know if it's getting good traction or if the brake has been applied. All in all, there is no point in the run where one can relax until the car has been safely slowed and off the track. After the car launches, I keep it in the center by looking around both sides of the supercharger. I look for the wall, over to the center line, back to the wall, and once again to the center of the track. I believe the car goes where the driver is looking and this is the best way to keep it in the groove. More goes on before, during, and after a run, than most people realize. Even before I get suited up and into the car, I try to look it over for loose nuts, bolts, fuel lines, or anything that may not be right. Every crew chief has their particular way of approaching a run and it should be done exactly the same each time. Mike always strapped me in. He would make sure the restraints were secure. Once strapped in, I make sure the reverser is in the forward position. A crew member will remove the safety flags from the fire bottle lever and the chutes. Before the car is started, the motor must be "backed off" to clear any fuel in the cylinders. This is done with a breaker bar, after which the starter is run for a few seconds with the mag and fuel pump off. When the car is fired, I have a firm hold on the brake and the clutch is depressed. If the engine gets too much fuel, the RPMs can come up with a force that can literally push your foot right off the clutch and make the car jump forward. As soon as the engine comes to life, I check the oil pressure and depress the clutch to keep it cool. 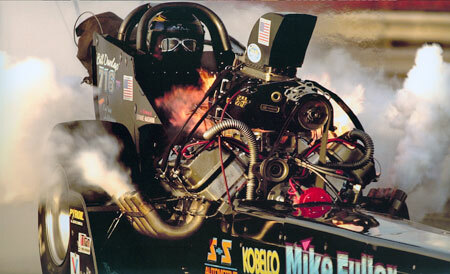 Once the engine has reached a particular temperature, Mike would motion me forward to start the burnout. I let off the brake handle and ease up on the clutch enough to roll through the water box and look for a crewmember to tell me when to start the burnout. Mike used a throttle stop to make sure we did the burnout the same every time and not hurt the engine by over revving it. Once the burnout procedure has been completed and I have backed up behind the starting line, I put the reverser in forward. With Mike directing me, I inch forward to a spot right before the first stage light. Then, Mike would make any last minute adjustments to the engine, check with the opponent's crew chief, and motion for me to stage the car. At this point, I would inch the car forward until the top stage light came on. Once my opponent's top light goes on, I will have my right hand on the brake. With the left hand I switch the fuel system onto the high side. Then, I take my left foot off the clutch and rest it on the floor. With my left hand on the steering wheel and my right hand on the brake, I inch forward to light the bottom stage bulb, and then pull hard on the brake. When I see the flash of amber, I simultaneously release the brake and press down on the throttle. If it's not a particularly good track, I will keep my hand on the brake to control wheel speed. At 300', I hit a lever on the steering wheel to retard the magneto. This is accomplished by driving with the thumb around the butterfly steering wheel and a couple fingers around the lever. I don't have to take my hand off the wheel, but I will need to open up my hand. If the race is close, there is a lever on the other side of the wheel that I can use to advance the timing. Nearing the finish line, I reach across with the left hand and hit the chute lever. I wait for the chute to hit before I use the brakes. If you get on the brakes just as the chute hits, it will exert a lot of pressure down on the chassis which is not a good thing. Of course, it doesn't always go as planned. Once at Bakersfield, I had a bad fire that literally burned off the strap for my goggles. When the chute hit, the goggles came off my face, and I received second degree burns around my eyes. Bill: We switched to an alloy block as soon as it was permitted by the Goodguys. The iron 392 blocks, as a result of sitting in some guy's garage or backyard, had bad cylinder walls, rusting from the inside out. At first, the Donovan was the only aluminum block available, and at that, still had to be mated with iron heads, preferably the '55 Chrysler model. 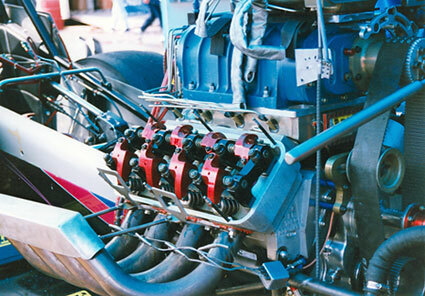 Then, the Rodeck billet block was allowed and that was a big step forward in terms of performance and safety. The billet block is stronger and will not flex like cast aluminum, and can be repaired unless it is really torn up. Finally, the AJ heads was a tremendous improvement in the way the engine breathes and stays together. Even though they are more expensive, it's worth it in terms of durability and safety. Something needs to be done about the M&H tire and the chunking problem. Someone is going to get hurt if they don't get a handle on it--the new Hoosier looks promising. Cost has been an issue for a number of years now. It may be immaterial to the five or six best funded teams, but for the rest of them, it's a real concern. 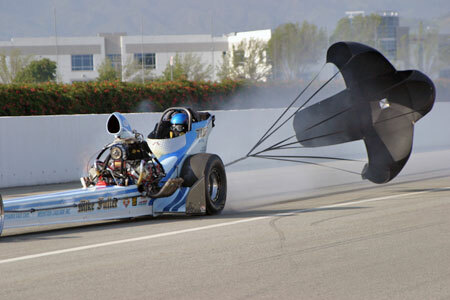 I think we have seen car count peak for the top fuel dragsters. Just in the last two years, several teams have sold or parked their operation. 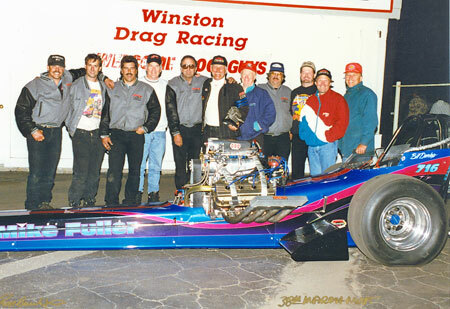 Bill: He was an outstanding person; a super gentleman; and, as good as there was when it came to driving a dragster. I never had to worry about him being in the other lane-he never goofed around or did anything stupid. At the CHRR last October, we both brought our baseball mitts and tossed the ball back and forth in the pits. I was supposed to bring my glove to the March Meet but forgot it. John told me he brought an extra one and to come above and play catch when I got the chance. I miss John a lot. Bill: Mike's sharp-always thinking about improving things to make it better. We may go out and run good one weekend, and despite that result, Mike may have a different plan for the next session. Sometimes we would take a step back in the short run to make two steps forward in the big picture. Actually, I'm somewhat surprised Mike has slipped as much as he has and not gotten a handle on it. But, he will figure it out and get it running well again. There is one other thing that should be mentioned about Mike. He has always wanted to see the low budget guys get as much or more of a break than the better funded teams-whatever it takes to keep the little guys in the class. 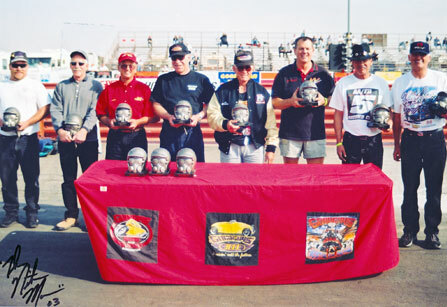 Goodguys 5 Second Club-Fuel & Gas Finals, Famoso Raceway, 2002 Left to right: Rick McGee; Rance McDaniel; Jack Harris; Gerry Steiner; Lee Jennings; Jim Murphy; Bill Alexander; and Bill Dunlap. 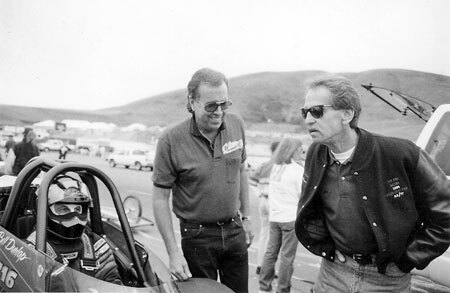 Bill, Mike, and the late Jim Herbert at Sears Point Raceway. 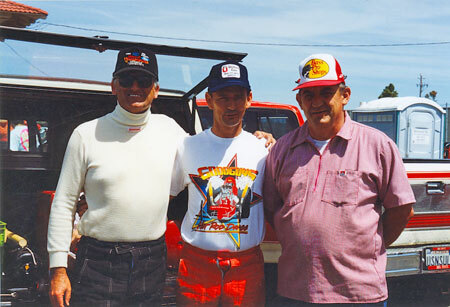 Bill, Ty Norton, and Jesse Perkins (both of whom have since passed).